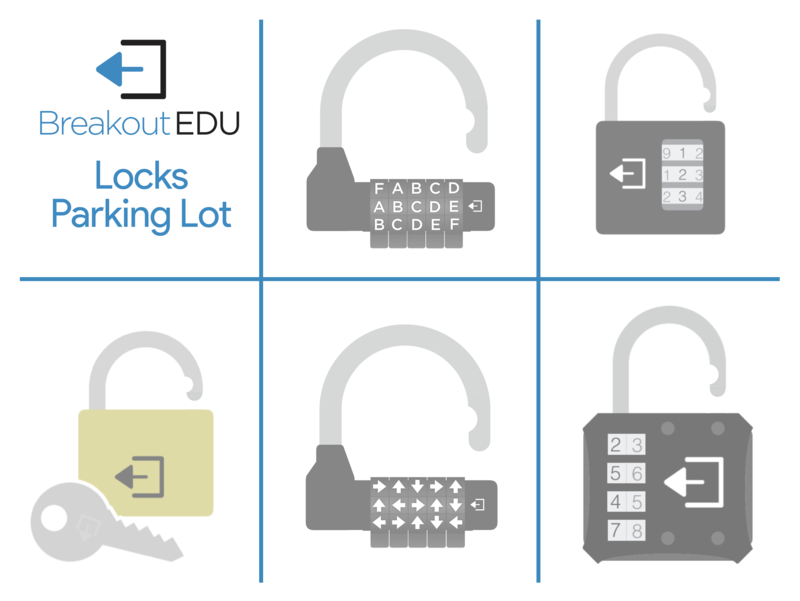 One of the best things the Breakout EDU kits is that the locks that come with it are resettable so that they can be played with all of the many games that our platform offers. Being resettable is amazing, but can occasionally become problematic if students play with the open locks once they remove them from the Breakout EDU box. One step you can take to limit the the locks accidentally becoming reset, is to collect the locks from the students as they remove them from the box. Another way to handle this is to use a "Lock Parking Lot" where the students place the removed locks as soon as they remove them. We have created a "Lock Parking Lot" printable that you might find useful. Here are some great tips for success that educators have shared with us to ensure that their locks don't get reset after a Breakout EDU game. Store the 3 Digit and 4 Digit lock in the locked position. This way, the combination that it was last set to will open the lock and you won't run the risk it accidentally being reset in transport or with students fiddling with the lock. The Multilocks can be stored with the wheels placed on the shackle. That way to open the lock and reset it, you simply need to align the small grooves with the red paint on them at the bottom of the lock to open and place the wheels on as you wish. The Word Lock (from kits before 2017) is the opposite, if you choose, you can store it in the open position. Open the lock and then use a coin to put it into reset mode. The Direction Lock (from kits before 2017) can be stored with the lock in the reset position. Open the shackle and push the pin on the rear of the lock into the up position. This way it is always ready to be re-set and you don't need to remember the combination. Having a look at the lock tutorials is never a bad idea for the first handful of times resetting the locks. Even the team at Breakout EDU is known to need a refresher once in a while. It probably goes without saying, but remembering the combinations to the locks - or at least the name of game which was last being played - always makes life a whole lot easier. To do this, put a post-it note with the name of the game the Breakout EDU kit is set up for in the box so you can find the combinations online if you forget them. Some facilitators make a private note on their phone with the combinations to all the locks. Another option for storing the locks after a game is done would be to reset them to a simple combination like 0000 or the like. That way you don't need to remember the game that the box had last been set up for and could just go through and set the locks as if they were new. Some educators may find it helpful to have students use a Locks Recording Sheet to keep track of combinations throughout the game. These are especially helpful when running games with a whole class.